The Austrian composer Walter Bricht (1904-70) was one of many musicians of Jewish ancestry who fled Vienna after the Anschluss for the safety of the USA; Bricht became a valued professor at Indiana University in Bloomington. 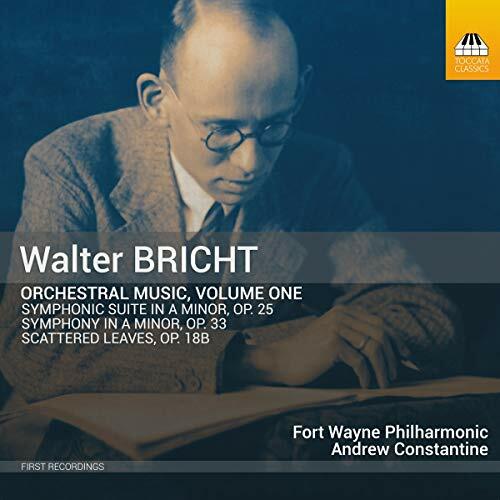 Fittingly, it is the nearby Fort Wayne Philharmonic, in its own debut recording, that has made the first album of Brichts music. The recording reveals another major Viennese voice and points to yet another potentially important career cut off in the bud by the Nazis. Bricht was reportedly Franz Schmidts favorite student, and the late-Romantic styles of the two men are indeed very closely aligned in their mix of Baroque counterpoint, Classical form and Wagnerian chromatic harmony: Brichts Symphony in A minor might almost be Schmidts No. 5. If you have any questions about this product by Toccata Classics, contact us by completing and submitting the form below. If you are looking for a specif part number, please include it with your message.